It’s also true that under Obama’s administration, Snooki from Jersey Shoregot pregnant and Charlie Sheen lost his job. And he can take about as much credit for those developments. The boom in oil production has taken place almost entirely on private and state lands, while on federal lands it’s dropped (11 percent from 2010 to 2011 alone). The administration has also slowed the permitting of offshore oil-and-gas development to a trickle. Fossil fuel (coal, oil, and natural gas) production on Federal and Indian lands is the lowest in the 9 years EIA reports data and is 6 percent less than in fiscal year 2010. Crude oil and lease condensate production on Federal and Indian lands is 13 percent lower than in fiscal year 2010. Natural gas production on Federal and Indian lands is the lowest in the 9 years that EIA reports data and is 10 percent lower than in fiscal year 2010. Natural gas plant liquids production on Federal and Indian lands is 3 percent lower than in fiscal year 2010. 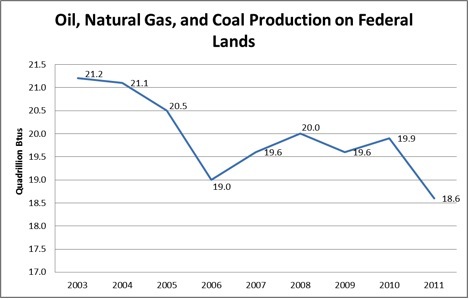 Coal production on Federal and Indian lands is the lowest in the 9 years of data that EIA reported and is 2 percent lower than in fiscal year 2010. Crude oil production on Federal and Indian lands decreased 13 percent from 739 million barrels in fiscal year 2010 to 646 million barrels in fiscal year 2011. Production of crude oil on Federal lands is dominated by offshore production, which fell by 17 percent in fiscal year 2011, mostly notably due to government actions taken following the oil spill in the Gulf of Mexico in 2010. These actions include a moratorium on offshore drilling by the Obama Administration, followed by a permit moratorium. Only recently has the Obama Administration leased any federal land offshore to oil and gas drilling. The big picture is clear that government policies undertaken by the Obama Administration have produced a significant decline in offshore oil production on federal lands in fiscal year 2011. That is certainly not a way to increase domestic production of oil and keep oil and thus gasoline prices in check. Thus on federal lands, where most of our fossil fuel reserves lie, Obama’s policies have resulted in a decline in production. The entire increase in production has occurred on private or state lands, areas in which Obama’s ability to wreak havoc are diminished. But on federal lands, where Obama and his out-of-control EPA have virtually unlimited power, oil and other conventional energy production is down. And yet Obama wants us to believe he’s responsible for an increase in oil production? Offshore, I’ve directed my administration to open up more than 75 percent of our potential oil resources. That includes an area in the Gulf of Mexico we opened up a few months ago that could produce more than 400 million barrels of oil. Hysterical! Let’s take Obama’s advice and do some basic math. Obama’s damned proud of the fact that he opened up an area in the Gulf that could potentially produce a whopping 400 million barrels of oil. But, and this is a big but (sorry for the visual), the U.S. consumes between 19 and 20 million barrels of oil per day. So Obama’s great concession to energy development in the Gulf means he added about 3 weeks to our oil supplies. (That will certainly impress the markets, right?) And this is only if some entity finds it commercially viable to incur the costs of underwater infrastructure and drilling for such a small reservoir of oil. I’m skeptical. Someone has a problem with math, but it isn’t those of us who advocate energy production. There’s plenty more in the IBD article, but you get the point. And IBD is only referring to oil. In a post about a year ago, I linked to a study which indicated that America has more recoverable fossil fuel resources (oil, coal, natural gas, methane hydrates, etc.) than any country on the planet, including Russia and Saudi Arabia. And Obama wants to use taxpayer dollars to grow algae. Brilliant. There’s no shortage of domestic oil or other fossil fuels, but rather a shortage of adults in the room at 1600 Pennsylvania Avenue. Obama, in his speech today, took another thinly veiled shot at Governor Palin when he repeated his claim that an increase in the supply of a commodity won’t lower its price. If you start hearing this “drill, baby, drill; drill, drill, drill” — if you start hearing that again, just remember you’ve got the facts — we’re doing that. Tell me something new. I can’t recall a president ever being so ignorant of basic economics. Supply and demand is not complicated. Neither is math. Well, maybe these topics are for an individual whose education was shaped by repeated exposure to Marxist dogma as espoused by the likes of Derrick Bell, Charles Ogletree, Bill Ayers, Jeremiah Wright, etc., etc. I digress. Someday, an alternative source of energy will be developed. But the development of an economically viable alternative that actually produces energy more efficiently than fossil fuels is decades in the future. And when it is developed, it will be done so by an entrepreneur in the private sector, not a political campaign contributor seeking the benefits of crony capitalism in return via taxpayer dollars for such boondoggles as Chevy Volts, algae, and solar shingles. (see Solyndra). Free markets work, but, unfortunately for Obama, they’re an abstract curiosity about which he has zero understanding. Thankfully, if we muster the common sense to utilize the natural resources with we’re so richly endowed, we can easily afford to wait until an alternative to fossil fuels is technically and economically feasible, a point Governor Palin has been making since before she emerged on the national scene.